Thank God for sweet friends! So, I'm in Savannah this week for a friend's wedding and it goes without saying that when I'm home, I have to get together with Lindsey... We're BFF. The background on us (and what we always joke about) is that we're long distance best friends, we always will be, and we sometimes wonder if we'd actually like each other as much if we lived in the same city. 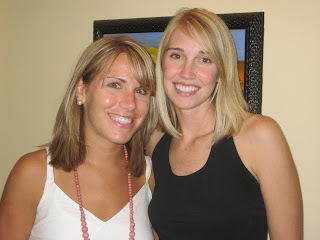 We were friendly in high school, but the Kathryn and Lindsey pairing really took off when we were both in college, home for the summer, and leaders with the senior high youth group at our church. Yes, the foundation of our friendship is built on hot, sticky summers at air condition-less camps wearing flip flops, bookbags, and very cool nametag lanyards... Putting on skits, leading songs, and cutting the line of kids waiting to tube on the lake (I insisted this was not kosher, but she convinced me we had the authority). We commuted back and forth between Johnson City, TN and Athens, GA and were always happy to both be in Savannah during Christmas breaks. We coached one another through break-ups (remember the picture burning bonfire, Linds?? ), celebrated football victories, laughed, cried, and prayed together. Though we've always been in a long distance relationship, we've never been too far apart to drive to one another at a moment's notice (literally). That chapter is quickly coming to an end, though. Lindsey and her husband Patrick are moving from Savannah to southern California next week. In closing this chapter of our friendship, Lindsey and I went to dinner tonight, just the two us, to spend some quality, girls-only, alone time. It seems that over the last few years, even when we've hung out, we've always had husbands (stupid boys! ), family, or other friends in tow. We were overdue for a solo night. So we spent the evening in City Market eating pizza at Vinny's, eating ice cream on Broughton, and maneuvering the cobblestones on River Street. We talked nonstop... She reassured me in the crazy parts of marriage ("Thank GOD I'm not the only one..."), reminesced about college, marveled at how different our lives have become in the last three years. We had a blast...it was all I could do to not cry when we finally pulled into my driveway, thinking of how long it's been since we'd had such a night and how long it will be until we do it again. As we discussed that night, though, there are simply chapters in life that come to an end and we always have to be prepared to move forward. Lindsey and I will always be great friends, we just have to learn a new form of friendship and learn how to be friends in a different form. Highlights from memory lane: Late night laughing games in Johnson City, riding saddled boys around the living room, tubing at camp and holding for dear life trying not to die in the lake we assumed would be child's play compared to our experiences on the river (we were wrong), deciding we were too cool to ring in New Year's with high schoolers, so we held our own dance party...just the two of us, a last minute road trip to Athens to see me (even when I had a final the next morning), NERD PROM!, changing the words to the Georgia fight song to express our feelings toward a certain ex-boyfriend, the "mascara incident", every minute of Lindsey's graduation weekend in Tennessee (including my showcase in Milligan College's senior program), being parrodied by the senior high girls at camp... I could go on forever.